It’s been a summer of gloom and doom highlighted by the disappearance of Imagine, Carnell, Rabbit and some others. Software and computer retail outlets have been moaning that nothing is selling and software companies have been upset that stocks aren’t being reordered. Some people are even saying that this coming Christmas, usually the good time, is going to be poor for sales. 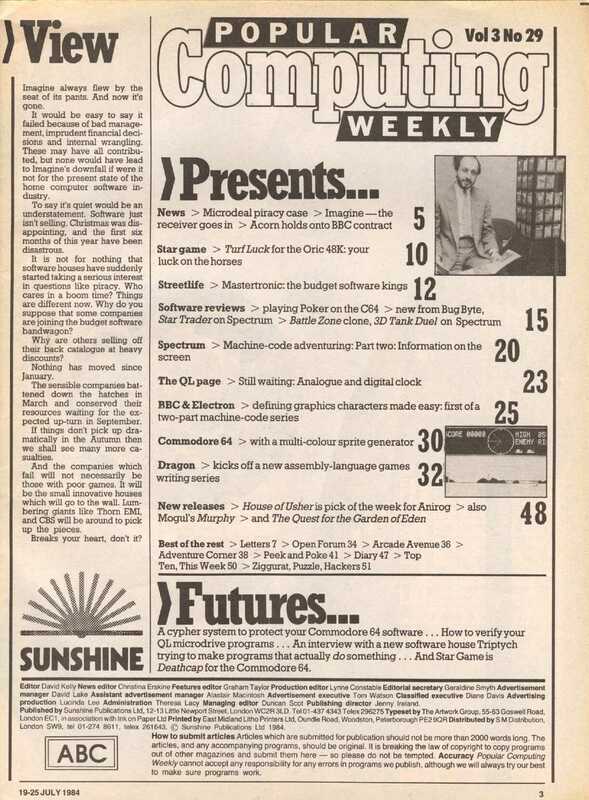 Boris Allan in the Ziggurat column (Popular Computing Weekly, 19-25 July) says that at one time software houses like Imagine were thriving with so much money boosting the coffers that the small disagreements which existed within the company, hardly seem to have mattered. But now the money is no longer coming in at a rate that will produce the enormously rich with enormous cars. He also goes on to say, quite rightly, that the problem with Imagine (and nearly every other software house) is a lack of imagination. But in the first point, the full coffers, is it really the case? Imagine excelled at one thing very well, publicity. In a short space of time the company became one of the best known in the software business. It never hesitated to point out to journalists (national press as well as computer press) how much every square foot of carpet in the offices cost, how much every hand-crafted nut and bolt in Mark Butler’s custom motorbike cost, how many thousands of pounds worth of Sage computers it owned for software development. It hit the headlines again and again with fanciful stories of teenage programmers earning £35,000 a year. If you are very successful at creating an image of success then it’s amazing how willingly banks and other investors will pour money in. 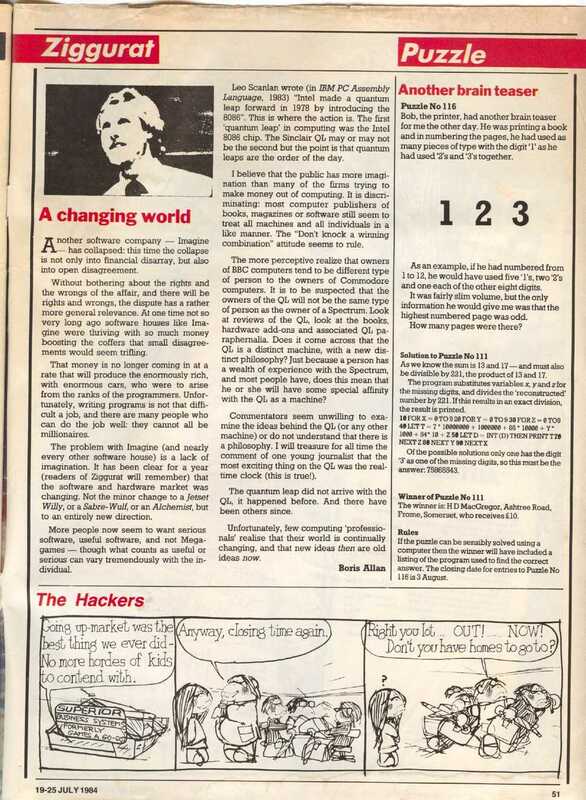 The partwork publisher Marshall Cavendish was prepared to front a quarter of a million pounds to develop games for their Input magazine — at which point it became clear that despite all the ad campaigns, despite Arcadia and Zzoom, despite the media hype, Imagine did indeed lack imagination. The point I’m making is this: are we really looking at a slump in the software market or are we looking at a case of severe indigestion? Early in 1983, about the time Imagine was forming around the success of Arcadia, there were only a handful of software houses producing Spectrum games. Today there are in the region of four times that number. Then it was almost impossible to purchase a cassette from a shop — a few W H Smith branches were displaying about ten games, computer retail outlets mostly sold hardware and there were only fractions of today’s number of shops anyway. Most software houses emerging from the back page classified’s of the magazines were still doing sales via their own mail order. Today hardly any significant mail order sales are made and there are literally hundreds of computer retail outlets selling software, and now newsagents have joined in as well. May it not be the case that we are looking at a market that certainly has grown with more Spectrums sold but that has not, however, expanded at the rate at which the retailers and producers have done? In other words, there aren’t enough punters in the markets to go around. It would be very easy to see that during last summer (also not particularly good for sales) everyone did better than during this summer, and interpret it as a disastrous, possibly terminal slump in the market. If you take this into account along with the collapse of apparently blue chip companies like Imagine, then the situation certainly does look gloomy. The real point in Imagine’s case is whether they really ever made the kind of money of which they so openly boasted? I don’t think so. Flashy cars and big houses can be easily bought with small personal profits from a rising company’s coffers using mortgages and hire purchase. Offices can be expensively fitted out using the goodwill and credit of local suppliers who can see from their newspapers and telly that the purchaser is doing well — why worry about the money? In truth Arcadia and Zzoom were Imagine’s only real big sellers. Was their PR true? At one point Mark Butler was heard to say that 75% of all Spectrum owners had bought Arcadia. Assuming at that time that half a million Spectrums were sold, that would have meant 375,000 copies of Arcadia had been purchased. This is a ludicrous figure! As any honest software house will tell you, a sale of 25,000 cassettes is good, 40,000 is a best seller and anything over is simply marvellous. Something well in excess of a million Spectrums sold may seem a lot. In comparison with the numbers of record players or cassette decks in use in British households it is probably in the region of one-fortieth. Consequently the market for music is far larger and sales figures in the music business are going to be a great deal higher. Companies like Imagine, with all their media hype, managed in a very short space of time to convince everyone that the British games software industry was a boom area like British music. Well true, but to only one-fortieth of the size. As a result software houses and retail outlets blossomed, jumping on the software bandwagon, and the market did expand, but not to the tune that the new entrepreneurs expected it to — because they hadn’t seen through the hype. And so many of the new software houses hadn’t seen through the gauzy haze of delight that all you had to do to make a few mega-bucks was churn out yet another pac-kong and punt it out at £6. Rabbit is a good example. Like Imagine they were also capable of quite successful hype, not in the press so much, but certainly with dealers. Claims of 60,000 cassettes sold per month in the summer seem highly exaggerated. In truth the only two games of theirs I have seen that were worth anything were Escape MCP for the Spectrum and Troopa Truck for the Commodore. They too had lacked imagination as a company. In Ziggurat, Boris Allan adds that more people seem to want serious software, useful software and not mega-games. Our impression at CRASH is that people certainly don’t want mega-games at £40. What counts as useful or serious says Boris, can vary tremendously with the individual. Games are serious and useful — they’re entertaining as well, of course, or at least they should be. Our impression is that people still want games, good ones, imaginative ones, games that are serious and useful in that they stretch the skills and abilities of the player. And we are fortunate that Britain possesses some very talented programmers who have been busy this year stretching the abilities of the Spectrum to match the expectations of the player. I was asked recently what I thought was most exciting about the Spectrum as a computer and I replied to the effect that it was the way that reviewers were able to say of a game that it had gone as far as the Spectrum could be pushed, only to have to eat their words the following month. As a nation of computer buyers and users we are going to have to make some serious decisions very soon. In fact the most serious decision about the future of British computing is being made without our consent as users. I’m talking about the introduction of MSX as a so-called standard. Well commercial decisions are frequently taken without the consent of the public in their presumed best interests. And MSX is being sold as being in the best interest of the consumer — a standard whereby any game written for any machine will be available for your machine, as long as it’s an MSX machine or can interface properly. The Japanese have failed or faltered in their attempts to force MSX on Americans and have, instead, turned their eyes towards the next best market — Britain. We’re being used as a sort of test case. But it isn’t just a jingoistic or nationalistic urge which makes me alarmed that computers like the Spectrum or the Amstrad may be swamped by some foreign import standard. It is quite simply the fact that we don’t need MSX and MSX is no good. Simon Bratell of Design Design (used to be Crystal Computing) puts the case strongly and well in our article Rebirth of the Things. A standard which is bound to appeal to software houses because of its ease of making simple sprite type games on a widely acceptable scale, is being introduced and heavily marketed which force programming into narrow and inescapable channels. If MSX grabs a hold, then you can wave goodbye to the exciting and heady days of programming advances such as we have been privileged to see on the Spectrum. We’ll be selling British innovation down the drain for the sake of a convenient standard and settling for a period of stagnation in games development. And make no mistake, America may be able to produce Hollywood on the Commodore, but Britain produces the high flying ideas on the Spectrum and will probably do so on the Amstrad. Development of innovative software does take time; often five months of a programmer’s time may go into a game (there are many games we can see where that’s patently not the case, but I’m talking here about serious programmers!) and that time must be paid for. It’s quite clear that a software house with respect for its customers, producing these more serious types of games cannot do so for a retail price of £1.99. You don’t have to be the least bit discerning to realise that few of the games which have yet been released at these low prices are in any sense original or really worth even the low price when it comes right down to it. In the same issue of Popular Computing Weekly, its editor in his View column remarks on the number of software houses joining the budget software bandwagon as a reflection on the stagnation of software sales. As I have already pointed out, a lot of the so-called slump is actually due to the glut of cheap looking (if not cheap priced) software. But a lot of companies indeed are joining the cheap bandwagon, and the operative word here is ‘budget’ software. That means the game, its contents and its program qualities are produced down to a price. As with MSX, by insisting on software houses not charging the £4 plus price we have been more used to, we are pushing the games software market into a cul-de-sac from which it might find it difficult to emerge — to our detriment. Imagine have been responsible for a lot — not the least being that when anyone wants to complain of software house rip-off prices for games they always equate the company with Imagine and mention fast cars and handmade motorbikes. Imagine have created an image for the software houses that doesn’t sit fairly on almost all of them. At CRASH we have always taken the view that, depending on the complexity of the game, a price of between £5 and, say £6.50 is a fair one as long as the game deserves it. These prices existed in the good times, they exist in the bad times. If software houses can really write good programs at a price of £1.99, well fine and good, we’ll support their efforts. But what is most urgently needed is some common sense, an ability to look beyond the immediate muddle, to be able to strip away the false hype from the real enthusiasm; there’s a need for the inefficient and possibly uncaring retailer to cease spreading despondency because his false hopes haven’t been matched by tough reality. Here at CRASH we hear from a number of retail outlets and as many have done really well this summer as have had a miserable one. That’s not surprising because, just like software houses, there are innovative, knowledgeable shopkeepers who offer quality for money and there are those who put profits and commercial considerations above the customers’ needs. Like retailers and software houses, there are good times and bad times — it’s a closed circle — we must make sure we get the best from the good times and support those through the bad times who help to make the good times even better. As if to underline the points I have been making so far, there are two marked differences between this and any previous issue of CRASH. On the one hand there are many less reviews than usual because the summer months have depleted the market of as many new games as there have been before (although the handful includes some excellent ones); and on the other hand we have been privileged to see rushed preview copies of three games by three very different software houses which, in their varying ways, are each going to push the outer limits of Spectrum programming even further out. Yes, people have been right — this summer has seen a weeding out, although by no means to the gloomy degree predicted earlier. But it has also acted a bit like a forge fire, tempering the steel of those software houses determined to offer value for money. I think this issue offers happy reading on several levels — Enjoy! I am told by Lloyd Mangram that several letters each month sent to him enclose mail order forms and payments. I know it’s often convenient to send two different items in one envelope (and cheaper on the postage) but readers who enclose mail order material with letters to the editorial side run the risk of delays in receiving their goods. The reason for this is that anything addressed to a competition or to Lloyd may well sit unopened for up to a week. So, in your own interests, please send anything to CRASH MAIL ORDER separately. As you are no doubt aware, there are a number of rumours that Salamander Software has gone bust; even to the extent of being printed as a statement of fact recently by one of the computer magazines. This is news to all of us here at Salamander. We feel that it would be useful and desirable to our loyal customers, and to inveterate rumour mongers, to inform them in black and white that Salamander is alive and well and currently working on new projects designed for release towards the end of the year. We do not deny that the annual summer slump of software sales has caused us to tighten our belts a notch or two, but we are not in a position of having to cease trading and do not foresee this happening in the future. We are only a phone call away, so should anyone else feel the urge to write us off, we would appreciate the decency of a phone call before organising the wake (don’t forget to invite us! ).